Stats for Zing + MMapDirectory would be very useful to those of us who need a persistent index. I second Steve's request. The Zing looks mighty impressive but if it also speeds up MMapDirectory, then RAMDirectory stays a non-viable option for most large setups. It uses as much RAM as you tell it to... like all other JVMs. There is one difference though: Zing has a kernel module, and that kernel module grabs the RAM as soon as it's started, and then the RAM is held for Zing even if no Zing JVMs are running. But if that's a problem you can manually stop the kernel module (service zing-memory stop) when you're not using Zing. which does not compile because DirectPostingsFormat is not an acceptable codec. A quick simple example would be greatly appreciated! Thanks for the post Michael. Can you share all the JVM options you used for the various runs? Also what are your thoughts on using linux ram disk as an alternative to RAMDirector or MMapDirectory? Besides setting max heap, and picking which GC (G1, CMS) to use, I left all other JVM options at their defaults. I think Linux RAM disk doesn't make much sense, because if you use MMapDir, the OS will soak up any free RAM and act just like a RAM disk, and a RAM disk of course isn't persisted so you lose the index on reboot/unmount. I have often wondered if some really bright person is going to create SmartRAM whereby you throw your search terms at a pipeline into the memory hardware. I am involved in a project where we are trying to solve a problem very similar to the one you are describing in your blog post. I am wondering if you would be available for a call/hangout/GTM to help us out. Not sure how elso to contact you. Will also hunt for an email address. 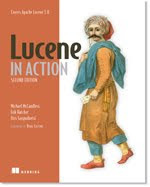 Hi, sorry, I'm not available now; maybe try emailing the Lucene user's list (java-user@lucene.apache.org)?